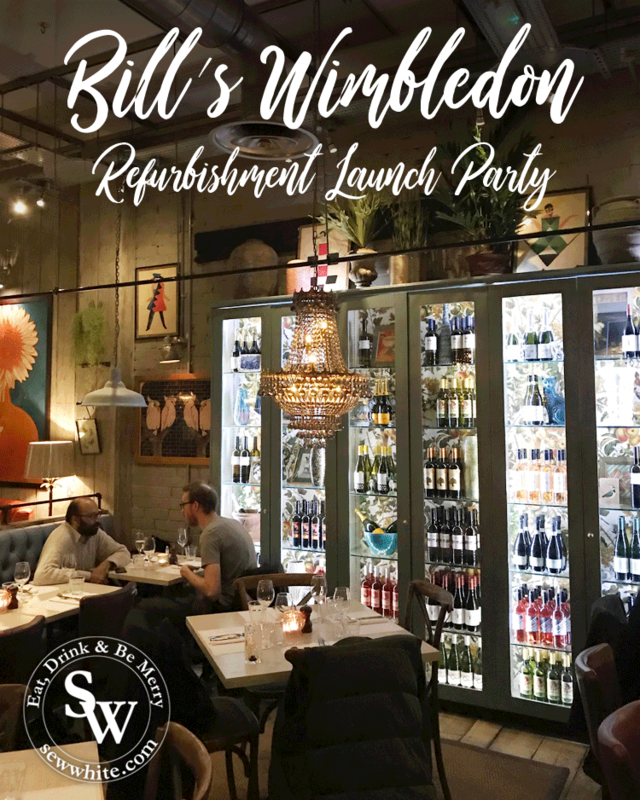 Bill’s Wimbledon celebrated their refurbishment and new menu with a Launch Party for local businesses with the founder Bill Collison. Bill’s Wimbledon is a lovely restaurant which caters for so many types of occasions. Date nights, brunches, work breakfasts, birthdays, Sunday lunches and for mum’s enjoying a coffee after the school run. Their unique restaurant has delicious food and the menu changes throughout the day. Allowing you to try different things each time you visit. I loved the restaurant before the refurbishment. However I was very intrigued how they would change the Bill’s Wimbledon space and of course… the menu. Walking around the corner to find the festoon lighting, picket fence and warm orange parasols I fell in love. The outside space has been transformed and will be so great to enjoy the space in summer and winter. Karine Torr from Darling Magazine, Bill Collison, Helen Clark Bell from Love Wimbledon and me (Sisley white). Being introduced to the man behind the restaurant was a dream come true for this foodie. He was so passionate about the food, having reduced waste and how he started in the restaurant business. Bill started as a greengrocer and when he had left over food he turned into dishes to sell the next day including soup and sandwiches. From there the business took off and now with multiple restaurants around the UK all focusing on their menu and community relationships. While I haven’t seen the full new menu I was lucky enough to try a few dishes at the launch party. I’ve not been a massive fan of halloumi before but this was incredible I definitely ate more than one. Now these were a tasty way to my heart. A little bit fiery but very moreish. Bill’s Collins – Wyborowa vodka, blackberry syrup, lemon juice, lavender bitters, soda. Now this a drink you need to remember is alcoholic. It was so fruity and far too easy to drink. Definitely one I’d recommend. Bill’s spiced tortillas with avocado and spicy red pepper dip and Crispy calamari with garlic & lemon aioli. These were so good. The tortillas and the avocado dip was one that I would definitely not say no to again. The calamari was crisp on the outside and soft on the inside and full of flavour. Dipping toasted focaccia into hummus is definitely a winner with me and the hummus was so creamy I could have had a plate and happily sat and enjoy it all night. The giant comfy sofas, bar area with high tables and stools plus the new tables and booths look incredible. The restaurant has gone from being a home from home to a home from home with a little sparkle. It’s a venue to visit for a chilled drink after work, brunch or dress up for a date night. Bill described it as a “fun farmhouse” look with a chance to experience something relaxed and not like anywhere else in the town. Milan GM Wahaca, Me (Sisley White), photobomber Helen Clark Bell and Bill Collison. Outside the entrance was this beautiful display perfect for photos and inviting for your instagram feed.